Sometimes coming home for the holidays isn’t as easy as it seems…. I had a really hard time starting my review for The Sister Season by Jennifer Scott. I didn’t necessarily dislike this novel but I didn’t really like it either. Weird, right? I did like that the story took place at Christmas. I adore Christmas and while this isn’t the typical Christmas story I like (I’m a sucker for cheesy holiday stories) I think setting the book during this holiday was a great idea. The holidays always seem to come with a lot of family tension (at least for most families) and that tension can make for a great story. The fact that it was Christmas added to the stress the family was feeling – the stress of dealing with the death of their father, or husband in Elise’s case. I wasn’t really sure how much of a hand Elise had in the death of her husband. It’s implied that she had something to do with it but we, the reader, are not really sure that she actually killed him. She doesn’t seem like a murderer but we realize, over the course of the novel, that Robert was an awful man and doing away with him wouldn’t have been the worst thing in the world. It was mildly frustrating that this issue was drawn out over the entire book because the final revelation was a little disappointing. I also really liked the relationship between the sisters. It’s ridiculously strained due to a misunderstanding between Maya and Claire that’s been blown way out of proportion over the past several years. Julia is sort of caught in the middle and is the peace keeper and middle woman between her two sisters. They had a very dysfunctional upbringing and that has translated into a dysfunctional adult sibling relationship. I loved reading the parts where they had to interact with each other and being able to see as they slowly worked their way towards putting their issues behind them. 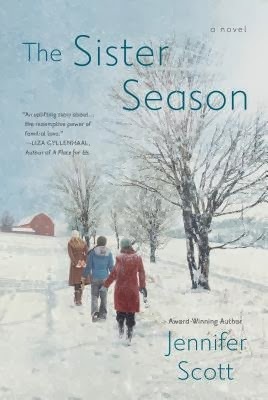 I have pretty neutral feelings on The Sister Season but I do think that many people would enjoy Jennifer Scott’s novels and that my issues were more personal than anything else. Just because I didn’t love it doesn’t mean you won’t!